A Province Of Sicily, including the N. E. extremity of the island, bordering on the Mediterranean and the strait of Messina, which separates it from Calabria; area, 1,768 sq. m.; pop. in 1872, 420,649. It is traversed from E. to W. by the Neptunian mountain range, and by the Monforte, San Antonio, and several other small streams. The mountains abound with wood. There are no large plains, but many valleys, which as well as the banks of the rivers are very fertile in wine, oil, nuts, and fruit of every sort, particularly lemons and oranges. The other principal products are silk, hemp, and flax. Some cotton of an inferior quality is raised for home consumption. The most important mineral product is sulphur. On the south a portion of the province skirts the base of Mt. Etna. It is divided into four districts and includes the Lipari islands. Among the chief towns, besides Messina, are Castro Reale, Milazzo, Patti, Randazzo., and Taormina. A City (Anc. Messana), capital of the province, on the N. E. corner of the island, on the strait of Faro or Messina, here about 4 m. wide, 120 m. E. by N. of Palermo, and 45 m. N. E. of Mt. Etna; pop. in 1872, 111,854. The approach from the sea is of remarkable beauty, the city rising in the form of an amphitheatre, and the dazzling whiteness of the houses presenting a picturesque contrast to the dark mountains in the background. The principal part of the city is built on the W. side of the harbor, paved with square blocks of lava, and contains several wide and handsome streets ornamented with statues and fountains. It contains more than 50 churches, the most ancient of which is the cathedral, and lias also an arsenal, naval arsenal, archbishop's palace, senate house, custom house, a large hospital, two theatres, a lazaretto, and numerous convents and nunneries. Messina is the seat of an archbishop. The harbor, one of the finest in the world, is about 4 m. in circuit, and can accommodate the largest fleet. The imports are colonial produce, cotton and woollen fabrics, hides and hardware. The total exports for 1870 amounted to $8,636,500, of which lemons and oranges were valued at $2,904,-225; olive oil, $2,306,855; essence of orange, lemon, and bergamot, $1,358,070; and raw silk, $476,780. Tartar, limestone, almonds, and filberts are exported in considerable quantities. The total imports in 1870 amounted to $5,853,-755. In the same year there were entered 1,284 steamers, of 763,022 tons, and 3,259 sailing vessels, of 360,214 tons; and cleared 1,274 steamers, of 745,900 tons, and 2,992 sailing vessels, of 324,421 tons. The principal manufactures are damasks and satins. Coral, tunny, and other fisheries are extensively carried on. Messina is defended by walls and bastions, a citadel, and many forts, and is considered a fortress of the highest importance, as commanding the strait of its name, and thus being the principal gate to Sicily from the mainland. A railway extends to Catania, 59 1/2 m., and another to Palermo is now (1875) in progress. - The origin and early history of the ancient city are involved in obscurity. It is believed to have been founded by colonists from Magna Graecia and Greece between 1000 and 800 B. C, to have made rapid strides in prosperity, and to have derived its name from a body of emigrants from Messene in Greece, the original name having been, according to Thucydides, Zancle, after the similar Greek word signifying a sickle (the form of the harbor). In 396, when it was celebrated for its flourishing trade, a Carthaginian army landed in Sicily and destroyed the city, which was immediately rebuilt by Dionysius of Syracuse, who expelled the invaders. About 280 it was seized by the mercenaries expelled from Syracuse on the death of Agathocles, who were called Mamer-tini, children of Mamers or Mars, and who subsequently applied for assistance to the Romans; hence arose the first Punic war, in the course of which the city was taken by its allies, and thus became the earliest dependency of Rome beyond the Italian continent. Cicero calls it a very great and very rich citv. In the civil war of 49-48 it was the station of a part of the fleet of Ccesar, and Sextus Pompey after his defeat by the fleet of Octavius under Agrippa (36) made his escape from it with only 17 ships. During the middle ages Messina continued to be an important city. To avenge the massacres of Sicily, it was besieged in 1282 by Charles of Anjou, king of Naples, but relieved by Pedro of Aragon and Roger de Lorn. In 1673 it submitted to Louis XIV. but he was compelled to withdraw his force's by the Dutch and Spanish fleet. In 1743 it was afflicted by the plague, and the great earthquake of 1783 destroyed and depopulated almost the whole city, and it has since been rebuilt upon a better plan. It suffered severely from an inundation in 1823. A revolutionary outbreak took place there in 1848, but the insurgents were put down by the Neapolitans (Sept. 7). The possession of Messina during the Avar of that year enabled the king of Naples to reconquer the island. Every attempt at a popular movement was punished with the utmost rigor, a strong garrison was continually kept there, and the fortifications of the place Avere strengthened. 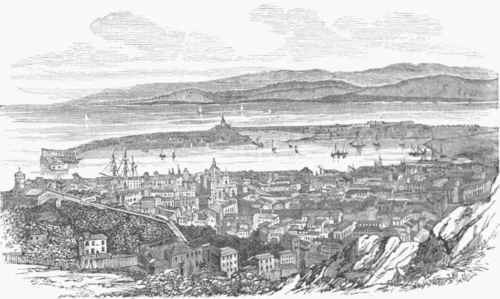 In 1860, however, after the victory at Milazzo (July 20), Garibaldi's army entered the town, and an agreement was soon after entered into by which the citadel and three forts were to remain in the hands of the latter, and the town and two forts in the possession of the Sicilians. The citadel was invested by Gen. Cialdini on March 7, and surrendered on March 13, 1861. The recent erection of a lighthouse, a mosque, and an agency for the metsagcries maritimes, and the repair of the streets, have absorbed every vestige of ancient Messana except a colonnade Avhose stones could not be made available.